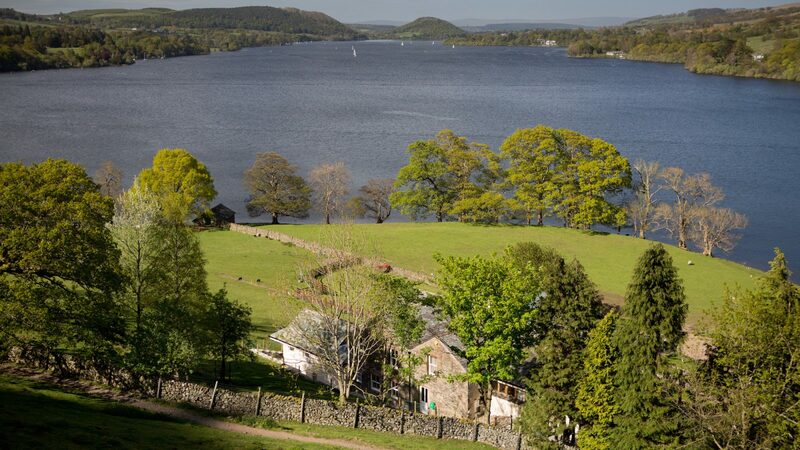 Sublime and secluded within 26 acres of English Lakeland, Ullswater House has special views over Ullswater and even more special specifications. Relax in the hot tub on the infinity terrace. Recharge in the spa and wellness centre. Fire up a movie in the private cinema. Luxuriate in stone and porcelain bathrooms. Be amazed. Location, location, location, they say. 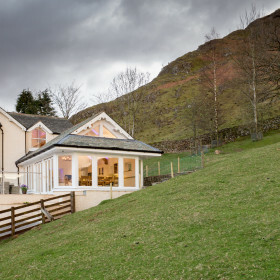 Well, Ullswater House sits at the head of romantic Ullswater, beckoning the lake and fell views in through the expanses of glass. The Lakeland steamers steam by, but the patrons aren’t waving. They’re staring, open-mouthed. 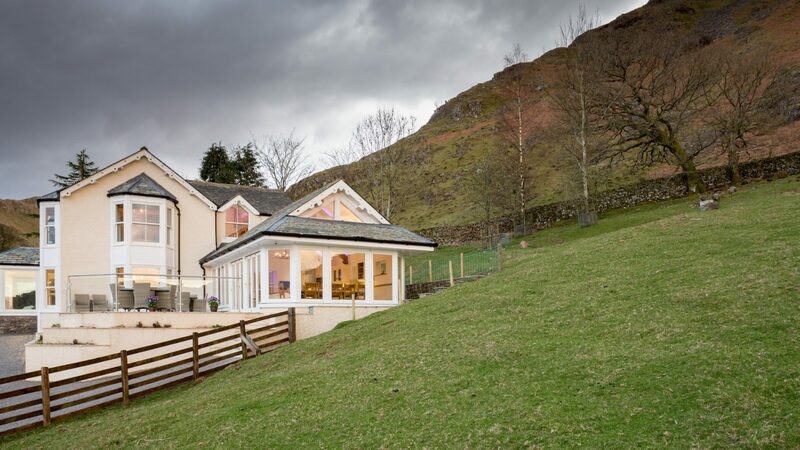 Because Ullswater House is far more than just a pretty view. It’s pretty special. 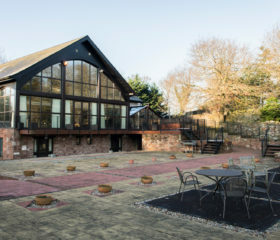 Sublime and secluded within a 26-acre slice of the English Lakes, it comes with terraced gardens that pay homage to the lake and mountains. 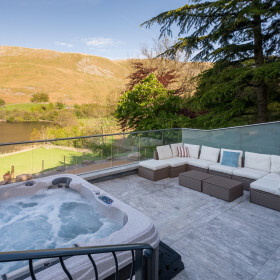 Laze and lounge on the sumptuous furniture or in the hot tub on the infinity terrace outside the spa; fire up the barbie – with storage – for steaks and Sauvignon in the clear country air. Inside? Well, there’s that spa and wellness area with laconium and bar. It’s a good start. 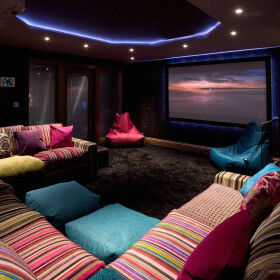 But how about a private cinema with Sky Sports and Movies? Break out the popcorn, because ours comes with mood lighting and the squishiest sofas in Lakedom. 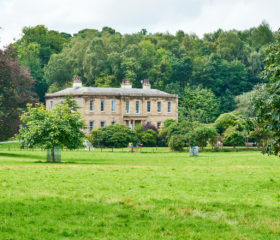 Need to escape? 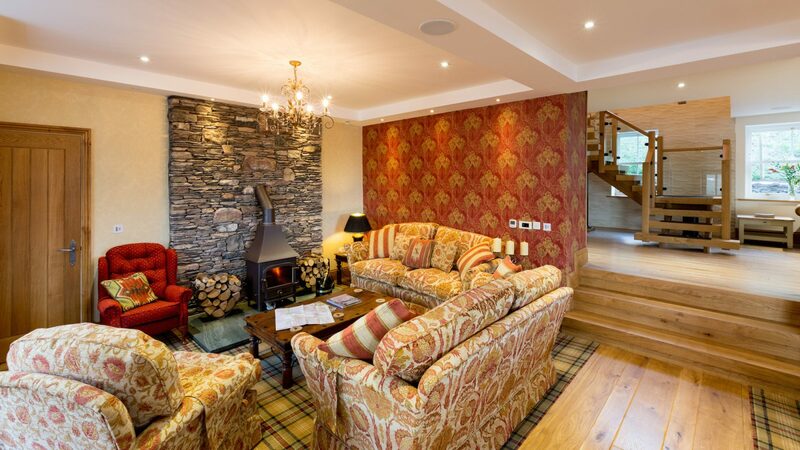 Light the logs and curl up in the reading room. What else can we offer? Set your soundtrack on the integrated music system with iPad control. 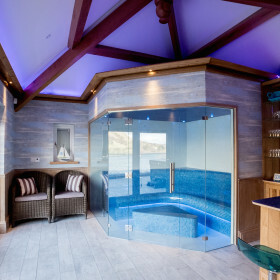 Start the day in one of six luxury stone and porcelain bathrooms with monsoon or rain showers. Is there a boathouse and private jetty? Of course. Can you arrive by yacht or helicopter? Be our guest. 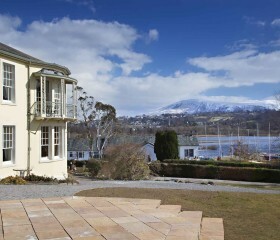 At Ullswater House, seeing is believing. The story begins before you arrive. You’ll have travelled through England’s most beautiful scenery. This is the English Lake District, where fellsides cascade down into shimmering lakes. 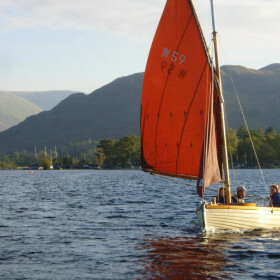 On Ullswater, the steamer chugs past with its cargo of waving holidaymakers. The sense of grandeur continues on arrival, as you purr up the long, sweeping driveway through your own 26-acre slice of Lakeland. Of course, you might have arrived by helicopter or yacht. Either way, you’re unlikely to be disappointed. Feel free to wander. 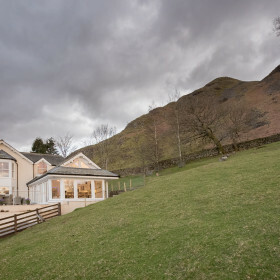 Make your way down to the half-mile of Ullswater shoreline, enjoy the majesty of the mountain backcloth. 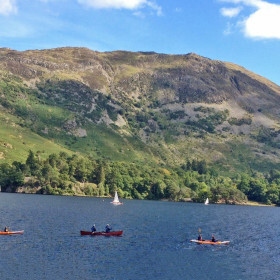 Take a bike out over the fells, or a canoe out on the lake. 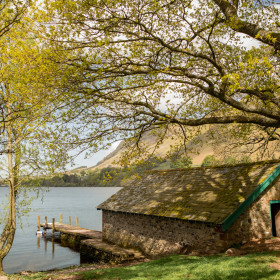 Or find the boathouse and private jetty and just escape awhile and chill. Spread out, relax. It’s not hard here. The drawing room’s a good place to start. 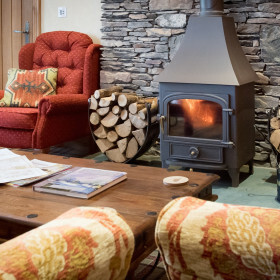 Get cosy with a book around the woodburning stove. Scan the fells with the telescope. Sink into the sofas and stare out of the windows. 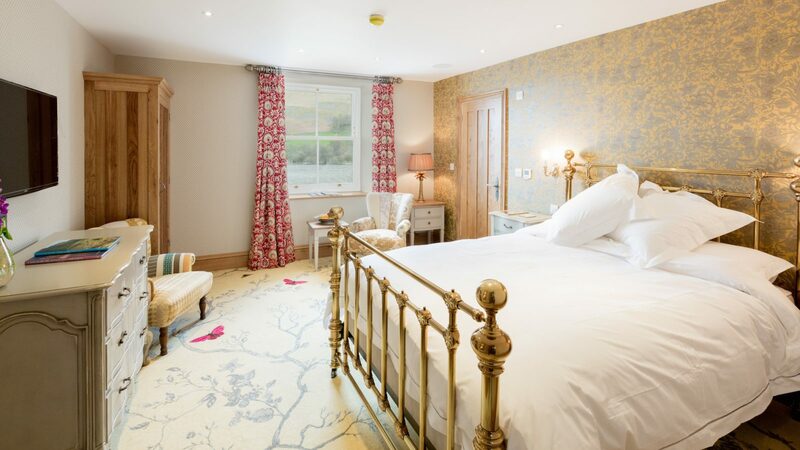 For light and airy lounging, move on up to the mezzanine and watch the sheep safely graze. Family film nights get no better than the comfort of your own private cinema. The screen’s huge, the room’s pitch black, the sofa’s a huge and happy place to be. You remembered the popcorn, didn’t you? 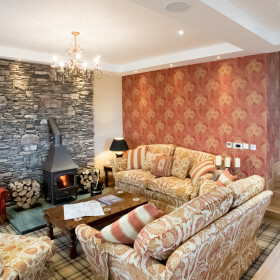 State-of-the-art technology, iPad-controlled mood lighting, plus Sky Movies and Sports combine for a movietastic experience. The soundtrack to your stay comes care of the integrated music system, and Bluetooth and wifi buzz throughout. Fire up Facebook and post sumptuous selfies that’ll make the folks back home green with envy. Got a pooch that’s part of the family? There’s no walkies like Lakeland walkies. So bring him along. The boot room’s not just for boots. Inside or out, it’s your choice. 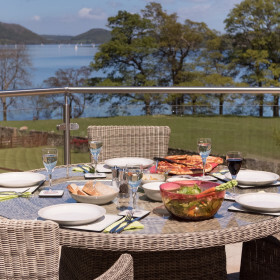 On fine days, few prospects are as enticing as our fully equipped barbeque infinity terrace complete with washing facilities and externally stored crockery. 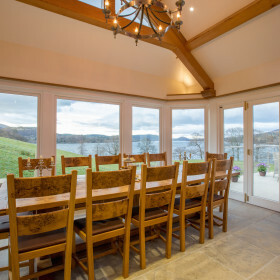 Just fling open the folding glass doors from the kitchen onto the terrace, get sizzling and slurping and enjoy dining for twelve. 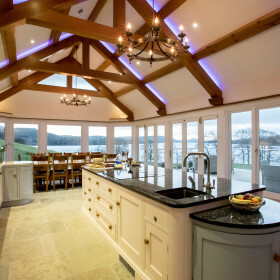 Inside, you’ll lap up the luxury in the large lakeview kitchen. 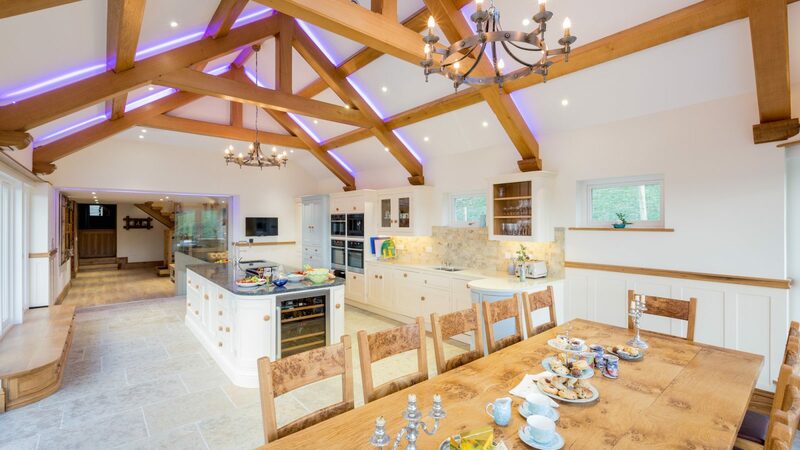 You can stare at the scenery all day long, but equally beautiful are the electric ovens and induction hob, coffee machine, warming drawers, red and white wine temperature storage and instant-hot-water tap. 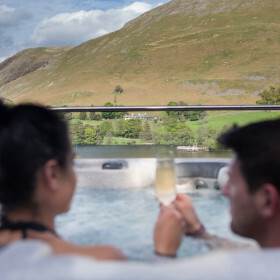 It’s a tough life here on the Ullswater shore. 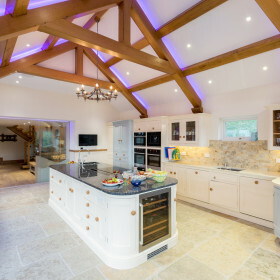 Lovely though the kitchen is, you might want to take things easy. 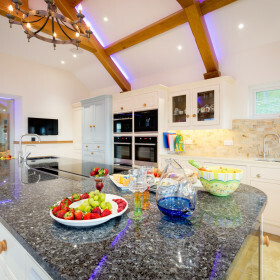 If so, call up our chef for a one-off celebration or a fully catered break. Put your feet up, pop open a bottle and chillax. We’ll even wave our wand over the washing-up. Eating on the hoof? There’s fine food and friendly service on offer at the Fellbites Café. 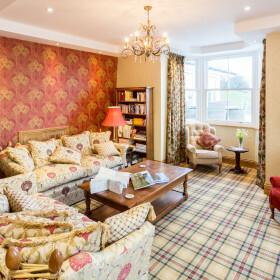 Try the Glenridding Hotel for fine dining in the Garden Room Restaurant or light snacks in Kilners Coffee House next door. 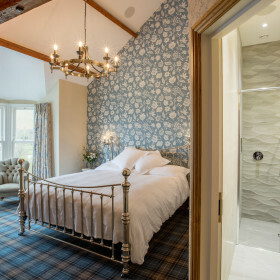 For that sparkling Michelin-star experience, try Holbeck Ghyll in Windermere. 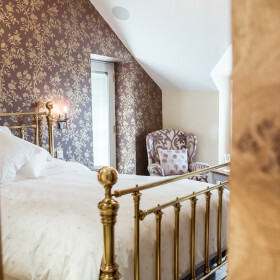 Ullswater House sleeps 12 in the sumptuous luxury of ‘And So to Bed’ handcrafted beds, Vi-Spring Elite mattresses and Brinkhaus Pyrenean duckdown pillows. 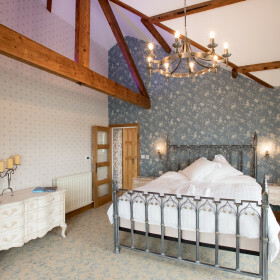 You’ll pad barefoot across heated bathroom floors to enjoy Villeroy and Boch fittings, and monsoon and raindrop showers. Surround-sound, integrated music, TVs and mood lighting come as standard in bedrooms that are havens of unfettered comfort. Fusedale is stylish and elegant with a front-row seat on the steamers’ comings and goings. Pikeawassa offers breathtaking panoramic views of the lake, raised designer bath and a superking bed. 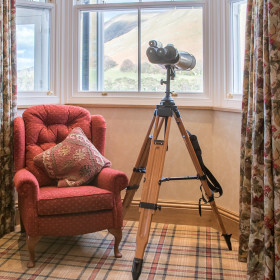 In 17th-century Martindale, you can settle back with a good book, or watch the birds and deer. 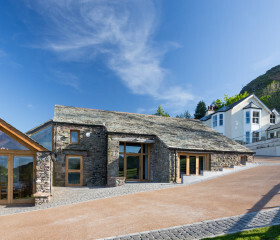 Boredale is the one to bag for private access to the spa and wellness sanctuary. The balcony over the lake views can be quite persuasive, too. No squabbling, now. 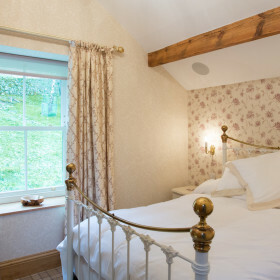 Hallin is a quaint and quirky 17th-century room with mountain views and plenty of grazing Herdwick sheep to count. 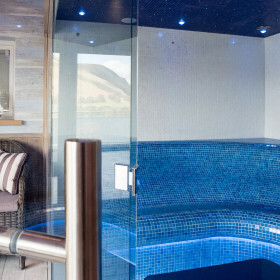 Bonscale overflows with opulence that includes a sunken natural-stone bathroom. Sweet dreams. 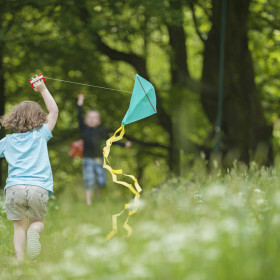 Walk the fells or up to Aira Force falls. Steam around the lake. Ponder the mystical and magical Long Meg stone circles. Picnic by the River Eden. Potter La Brocante Emporium for antiques. Make animal pals at The Alpaca Centre. Cycle, mountain-bike, pony-ride. Breathe the air. Feel alive.